Darren Rowse, from Problogger said Teaching Sells is one of the most compelling and viable approaches to a real online business he has come across. I totally agree with that. Basically, Teaching Sells teach you how to to create membership websites that actually sell with Five Step-by-Step Training Courses. Here’s What you will learn when you enroll in the Teaching Sells Training Program. Forum access to instructors and a step-by-step methodology to build your first paid interactive content site. 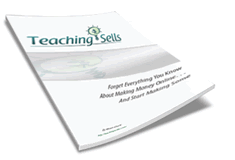 You can download the free report to evaluate Teaching Sells first. One of the most important things is that Teaching Sells provide members A Private Label Rights Content Library containing high-demand niche content (updated monthly with fresh ebooks and articles) that you can repurpose for your membership sites. The following are few examples of the e-books that you can download and resell. Teaching Sells members are able to promote the training program and earn substantial commissions as well. The affiliate program is available to members in good standing only, so you won’t be competing against the whole world. They will pay you 50% of the initial sign-up fee (currently $197) when someone joins Teaching Sells from your referral. Plus, they will also continue to pay you 50% of the monthly recurring fees (currently $49) for that subscriber who remains in good standing beyond the first three month period. Commissions are paid monthly via PayPal Mass-Pay. They pay by the 20th of the month after the month in which the commission is earned.